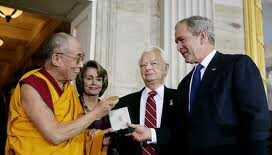 When the Dalai Lama received his Congressional medal on Oct. 17, 2007, thousands of Tibetan monks watched from a across the globe via New Media Mill’s world-wide webcast. The webcast provided five hours of uninterrupted streaming, from the medal ceremony with President George W. Bush to speeches outside by dignitaries and celebrities, including Richard Gere. ? New Media Mill’s live streaming servers registered 47,000 hits during the ceremony and another 20,000 in the month that followed. On-line pre-registration added about 5000 new subscribers to the Save Tibet’s email list, a big boost for the organization. There were about 7000 pre-registered users from the US, about 1700 from the Netherlands and another 100 in Germany. ?But the links to the webcast were also widely spread among exiled Tibetans worldwide according to Clifton. A cell phone photo was sent from India showing hundreds of exiled Tibetan monks hovering near computers to watch as the medal was bestowed on His Holiness the Dalai Lama. “In terms of using this event to reach our core constituency, (the webcast) was more successful than the event itself. It became much more of an international event because Tibetans around the world were tuning in and celebrating real time,” Clifton said. ?Ore-event publicity helped spur the success of the webcast. Save Tibet has close ties with hundreds of meditation groups around the country which helped with viral marketing. And, USA today published a story the day before the event, which noted that a live webcast would be available for free. ?Initially, the webcast was viewed with skepticism by many staff inside SaveTibet.